The Wineburgh Philatelic Research Library (WPRL) in Richardson, Texas is unusual in that it is an integral part of McDermott Library at the University of Texas at Dallas. I’m not aware of any other philatelic library that is affiliated with an academic institution. WPRL was founded in 1976 (35 years ago) by the late Harold Wineburgh, and it is supported by an endowment created by Wineburgh. As part of the Special Collections Department of McDermott Library it has some advantages not enjoyed by our volunteer run philatelic libraries. 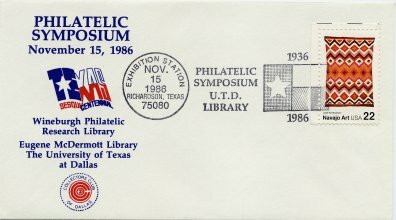 A primary beneficiary of this arrangement is the Texas philatelic community. It’s collection, including thousands of volumes, over 100 philatelic periodical subscriptions, and a large collection of auction catalogs, is readily accessible to philatelists and researchers. The collection is especially strong in Confederate postal history. The library houses and maintains the records of The Texas Philatelic Association, Inc.. The collection of WPRL can be accessed online through the McDermott Library automated catalog. WPRL is a founding sponsor of TEXPEX which will take place on April 15-16 this year in Dallas. In the past WPRL has been a sponsor of several philatelic symposiums. Next Next post: Do you recognize these albums?